Transfer factors were discovered in 1949 by U.S. physician H. Sherwood Lawrence. While studying tuberculosis, Dr. Lawrence demonstrated that an immune response could be transferred from a previously infected, now healthy donor to a newly infected patient by injecting an extract of white blood cells (leukocytes). He named this substance which transferred immunity "transfer factor." All mammals produce transfer factors, which are introduced to infants through their mother's milk, specifically in colostrum. Colostrum, sometimes called “first milk”, is the richest source of concentrated transfer factors. Transfer factors in colostrum have the primary purpose of transferring immunity from the mother to the baby's immature immune system. Interestingly, transfer factors apparently cross mammalian species lines, which means that when a person absorbs transfer factors from a cow's colostrum, the person develops resistance to the pathogen to which the cow was exposed. 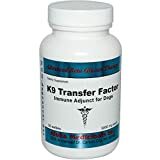 Transfer Factor supplement formulas contain colostrum and other ingredients like saw palmetto, lycopene and gingko biloba.